All articles related to wood stoves will be found here. Burning wood stoves, buying wood stoves, and heating your home with wood stoves plus much much more! Well Ellen, they are both great stoves. I do love the top loader in the Vermont Castings as you know, but unless there is a really good reason I typically shy away from the catalytic stoves because of the replacement costs. The Vermont Castings Intrepid II is a catalytic stove. The Hearthstone Craftsbury is not. So my recommendation in your situation would be the Craftsbury not just because of the non-catalytic system but also because I would go with your gut on how it is going to fit into your room. Your new stove will be off more than it is on and having it look right in the room is critical. I used a Craftsbury for a few years in my own house as the sole source of heat and was extremely impressed with it. First, thank you. Your reviews are tremendously helpful. We live in Southern California, where people are not so well informed on wood stoves, even though many use them in areas not connected to the gas grid. So the resource you provide is most appreciated. Second, we have access to tons of wood, so we are looking to buy a wood stove to heat our 1100 sq ft home. It has three main living areas separated by walls/doors, and a bathroom. We need it for about half the year, most of which it is only needed for parts of the day/night to raise the indoor temperature by 10-15 degrees. We’d ideally like it to be our main heating source, supplemented by an existing fireplace in the living room. If you have a recommendation for the best stove(s) for this application, I would be most grateful. In your case I may suggest a catalytic stove. Simply because it can burn at a cooler temperature and not have problems. A non-catalytic stove requires a hotter fire to engage the secondary burn system and since you live in a very moderate climate I think that may tend to be an issue for you. The catalytic stove is a lot more forgiving in that if you want a smaller or even cooler fire it will still burn efficiently and blast you out of your home. There is the downside of having a catalyst that you have to replace every few years but that is still what I would recommend for you guys. So with that being said maybe the Vermont Castings Intrepid II might be a good option. If you did not want to go with a catalytic stove I would make sure it was a fairly small stove. Rated to heat 600 or 700 sq feet. Again just because of the fairly moderate climate. Stove smoke coming back into house, why? This is a question that I hear all the time around fall about stove smoke in the house. A lot of people do all the maintenance they are supposed to do, have the chimney and stove completely cleaned and inspected in the summer. They have cured wood and have burned stoves for years and yet for some reason are getting the stove smoking back into the house. The answer is simple but sometimes hard to figure out. We may do this another time or two, or maybe even just this once then the next time we try to start the stove it is really hard to start and we get a bunch of stove smoke back into the house every time we open the door. So we think there is something wrong with our stove, and call our stove guy! So the solution to all the stove smoke coming back into the house is pretty simple. What is happening is that when you are burning a “cold” fire the chimney is not getting “charged”, or hot enough. Also the secondary combustion (reburn tubes) are not getting hot enough to ignite the unburnt smoke. So all of this “cool” smoke goes up the chimney and ends up condensing or hardening on the first cold thing it touches. 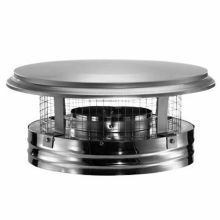 Both on the inside of the chimney and also the reason for your stove smoke coming back into the house, the “spark arrestor” that is in the chimney cap (pictured below). The spark arrestor is their so that if a live ember flew up the chimney the spark arrestor would catch it before it hit the trees or the roof of your house. The solution to the stove smoke coming back into the house is to get up on the roof with a screwdriver and bang on the spark arrestor screen a few times. This will break loose enough of the condensed creosote to let your stove draft properly. I always recommend to my customers to check their local codes and then completely remove the spark arrestor, if code permits of course. Because I think they are a bigger pain than they are worth. I hope this helps you get off to a succesful burning season with a little less frustration. And as always if you have any specific questions shoot me an email and I will try to answer all questions and maybe we can all learn from them. Is an epa certified stove more efficient than the old style? Wood stoves can come in all shapes and sizes, but when you break it down they are basically a metal box that you can build a fire in. This fire creates heat and the heat transfers through the metal to warm your house. The difference between and EPA certified stove and a non-certified stove is what we will discuss here. The catch is that they have to be vented to the outside of the house for the smoke and exhaust to get out. And naturally a good portion of the heat and un-burnt smoke goes up the chimney. This can lead to both a lot more wood being burned than is necessary and unnecessary air pollution that is a big deal in different areas. So about 22 years ago now the EPA (Environmental Protection Agency) stepped in and started requiring manufacturers to pass specific testing and enforce EPA certified stoves to be the only ones that could be sold. An EPA certified stove is still the only type of wood stove that you can buy to heat your home in the US, Canada and many other countries. The US just last year passed some laws that will not allow you to sell your home with an un-certified wood stove present. It must be removed and recycled before closing. So what is the difference between an EPA certified stove and a un-certified wood stove you ask. Well as you might guess it is the emissions, which is what the EPA’s job is to regulate. Most older un-certified stoves emitted up to 100 gr/hr (Grams per hour), EPA certified stoves are required to be less than 7.5 for non-catalytic and 4.1 for catalytic currently, with laws coming in the near future threatening to tighten that up even farther. The benefit to a consumer besides polluting less is actually getting a lot more heat into your home for every piece of wood that you burn. The difference between that 100 gr/hr and the average EPA certified stove of about 3.5 gr/hr is that you are burning every little bit of fuel up and thus using a lot less wood to get the same or more heat. Other benefits are less ash, cleaner glass door, and a cleaner chimney. A cleaner chimney actually makes a wood stove safer because you have a lot less chance of chimney fires. That 100 gr/hr building up on the inside of the chimney the igniting at a later date is called a chimney fire and I think is one of the major causes of house fires with wood stoves. That risk is signifigantly reduced when you only have about 3.5 gr/hr of particulate going up the chimney. Hopefully this has given you some good information about what an EPA certified stove is and why it is important. Anything sold since roughly 1990 will be EPA certified, there will be an article in the near future with how to tell if a stove is EPA certified or not. Stay Tuned! This is a guide to wood heating was published by Canada Mortgage and Housing Corporation, an agency of the Canadian federal government. From its first publication in 1993, this booklet has been very popular. Tons of copies of this book were ordered and distributed by insurance agents, fire departments and wood heating retail stores. Although it was written for Canadian citizens, so the references to installation codes and laws may not be applicable outside of Canada, there is a lot of useful information in it’s 80 pages that can be applied anywhere. Most of our articles will expand in more detail on some of the topics discussed in this book, but I thought it was a nice free resource to make available to anyone that was interested. If you do take the time to read it please leave us some comments on sections you particularly liked or didn’t like..
Do people actually still burn wood to heat their home? Yes absolutely, people burn wood stoves as their primary heat source is on the rise in most parts of the country. According to the US Census bureau in 2010 over six million homes in the United States burn wood as their primary heat source (only 2% of the population, but still that is a lot of people). This is even higher for those having a wood stove as a secondary heat source. It definitely depends on what part of the country you live in. Below is a map that USA today published in an article toward the end of last year. I personally think that although burning wood can be a lot of work, very messy, and not convenient all the time, it is one of the best ways to heat your home. It gives that wonderful, dry, penetrating warmth that I don’t think you can really get from any other type of heat. Whether you live in the country and have access to your own wood or need to buy your wood, it can be one of the most economical ways to provide warmth for your family, which is one reason I think we are seeing the trend we are above. A lot of us are trying to save money any way that we can and heating our homes is a big bill every year. One of the main reasons a lot of people ask if anyone still burn wood stoves is because of all of the laws, regulations, and media coverage on wood stove smoke and pollution; but I would say that there are countless government programs and rebates out their at the moment to promote people to either install a new “epa certified” wood stove or upgrade their existing 20+ year old uncertified stove to a certified one. So I don’t see wood stoves going away anytime soon, but I do see laws in the future banning the use of uncertified stoves and tightening up even farther on what constitutes an “epa certified” stove. The current federal standards are that a non-catalytic wood stove has to be less than 7.5 grams per hour of emissions and a catalytic stove less than 4.1 grams per hour. Some states have even stricter requirements like Washington state says that non-catalytic wood stoves have to be less than 4.5 grams per hour. These numbers are down from around 60 grams per hour that your traditional “steel box” wood stoves would have been.